 Dew (American Studies/Williams) uses the meticulously kept records of Virginia slaveholders to create an engrossing, often surprising record of everyday life on an estate in the antebellum South. 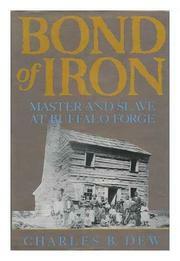 Initially, Dew gives a matter-of-fact account of the prosperous business of entrepreneur William Weaver and Daniel Brady, Weaver's niece's husband, at Buffalo Forge and Etna Furnace, Weaver's western Virginia ironworks. The industrious and litigious Weaver was a shrewd businessman whose humanity to his slaves was practical rather than altruistic. Dew tells how Weaver built his slave labor force, trained them in the intricacies of forge work, and motivated them to work hard through incentives--notably, his ``overwork'' system in which he paid the slaves wages for tons of iron manufactured in excess of production quotas. Then Dew goes on to tell the stories of the slaves themselves--including Sam Williams, a master refiner at Buffalo Forge and Baptist community leader who earned overwork only when he chose but who also maintained a high standard of living for his family; Garland Thompson, ``an imposing figure of a man, courageous and unflinching when confronted by white authroity and capable of prodigious feats of strength and workmanship.'' Finally, Dew tells how the Buffalo Forge community broke up during the crisis of the Civil War, with the growing demand for iron finally exhausting the supply. Diphtheria, typhoid, and tuberculosis epidemics claimed slaves' lives, and Weaver's death in 1863 ended Buffalo Forge's productive life. After 1868, the forge finally closed and sharecropping replaced industiral work among the black community at Buffalo Forge. A novel contribution to the massive corpus of literature on American slavery--one that shows slaves as skilled artisans leading lives of considerable dignity and achievement, who despite their accomplishments under the slave regime never stopped yearning for freedom.